Laying Workers. Why they are there and how to fix the situation. Laying workers are caused by a lack of queen and Brood. In as little as two weeks the workers of the hive can begin to develop the ability to lay. They do not have the ovaries of a queen, and are not capable of mating, so they can lay one to two eggs a day. 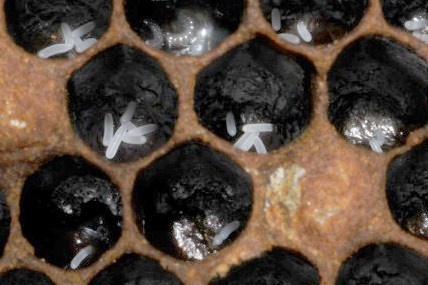 In order to get three or more eggs per cell like is often seen in a laying worker hive, hundreds, and perhaps thousands of workers are beginning to lay. I have seen many arguments about how to fix the situation, and weather you should even TRY to fix the situation.. If you have 20 or more hives I can tell you its faster and easier to shake them out and start over with their drawn comb. If you have only a few hives, and need to save them, then I will go into detail about what I have done that worked to save them. First.. Shaking them out.. It means taking the frames from the laying worker hive twenty paces or more away from your hives and SHAKING the bees off of them onto the ground. I do this in multiple places so the bees that return will return to multiple hives to strengthen them. Remove the original box, or place a hive that needs a boost in field force in that location. The bees will all eventually find a place to go. In order to fix a laying worker hive, we have to understand why they started laying in the first place. Lack of Pheromone, both brood and queen, is what causes the workers to begin developing their ovaries. In order to reverse this, they need brood pheromone. Some have said putting a queen in a cage into the hive will work. I have never had it work, but cannot deny that some claim it has.. A laying worker hive HAS queen pheromone, it is being put off by the thousands of laying workers. If Queen pheromone inhibited a laying worker, they would reach a point of balance, and it would be easier to fix the situation. Since it does NOT, they continue to develop until the vast majority of workers are laying.. If the situation is caught early, a single frame of open brood may be enough that they start emergency queen cells.. If the situation goes further, it may take two, or even three frames of open brood, spaced a week apart before they begin to draw emergency queen cells. The Emergency queen cell is the key. Once they start that cell, you can.. Allow them to make that queen, or remove the cells and install a mated queen in the normal manner. Obviously giving them a mated queen will be the fastest way to get them back to normal. point would never have been reached because there would be some point of equilibrium where there was enough queen pheromones to suppress any more laying workers developing. Three weeks of open brood is enough to suppress the laying workers and to get back to that level where they don't have that much queen pheromone and they now know that they need a queen and they also have the means to make one, so they do. In Effect, Mr. Bush stated the same thing I have but in a much more understandable manner. Those bees strengthen the queen right hive. As always, there are options, and this is only how I know works.